The Archbishop of Canterbury delivered a sermon for Opening Eucharist at the 'Council of Anglican Provinces in Africa All Africa Bishops' Conference, Entebbe, Uganda, from here. My dear brothers and sisters, first let me say a word of heartfelt thanks for the invitation to be part of this wonderful occasion to share fellowship with you, to learn from you. Archbishop Ian thank you and thanks to CAPA for the invitation, Archbishop Henry thank you for all you have done to welcome us all here in this jewel of Africa. I want also to bring the greetings and the prayers of your brothers and sisters of the Church of England many of whom will be praying alongside us in these days ahead and will look to see and hear the great things God will do in this assembly. Now I apologise to those in this congregation who are not bishops because I want to speak this morning first of all about the ministry of the bishop because this is a conference for those on whom responsibilities have been laid for the leadership of the church. Our readings this morning fill out the nature of that responsibility. When we are made bishops, we pray that we may be given the grace to follow the one Good Shepherd, Our Saviour Jesus Christ, knowing that only in following him will we be set free to help bring about in his world the changes that he desires. As St Peter's first letter makes plain, our shepherding has to be like his, grounded in the free, loving will of God to give and sustain life. In this Conference, which offers so much hope for the churches in Africa and their brothers and sisters worldwide, our focus is quite rightly on the nature of this new life and of those changes that God desires – our focus is on our responsibility to bring healing, justice (and sometimes judgement too), to bring hope where there is none; our responsibility to show the society we live in that there is a way of life together in society that, because it is in accord with God's purpose for men and women, promises fullness of life both here and hereafter. It is the responsibility to show that peace lies with God alone. 'He will settle disputes among the nations, among the great powers near and far' says the prophet Micah (4.3). And the prophet goes on, 'Each nation worships and obeys its own god, but we will worship and obey the LORD our God for ever and ever'(v.5). We will worship and obey the God of Micah and the prophets because only in his power and grace can human beings come to see each another as equally loved and treasured by him and so to see each other – the good and the bad, the saintly, the selfish and the confused – as all, without exception, worthy of love and service. We have the responsibility brothers and sisters of showing the world how precious a thing is a human being – and a special responsibility to show the world the preciousness of those who are hated or neglected by others or by society at large. A few months ago, I was able to speak to the Synod of our Church of England about the work done in this province of Uganda for the rehabilitating of child soldiers after they have been forced into terrible and dehumanising actions and habits. There are many more stories of this kind, which you know better than I. The Church here has bravely refused to turn its back on those living with this and other kinds of stigma, so as to say, 'All are precious in God's sight'. Only yesterday afternoon I had the huge grace and privilege of seeing the work done at the Mildmay hospital here in Entebbe with children living with HIV and AIDS who spoke how the gospel of Jesus Christ enabled them to live in hope to face and contest the stigma that so often so unjustly lies upon them. I shall take that back as one of the greatest treasures of that visit. Now to come to this realisation that God treasures the persons he has made is one result of recognising what it is that Jesus Christ has done for us. God in Christ is – we can almost say – unable to bear the terrible results of our sin and our abandonment of his ways, and so he makes himself an offering to take away our sin. 'Whoever comes in by me will be saved', says the Lord in today's gospel (Jn 10.9-10);'they will come in and go out and find pasture...I have come in order that you might have life – life in all its fullness'. All this is possible because Jesus Christ in his death and resurrection has opened the door, the door that no-one can shut (Rev.3.7); through him we may pass into the Father's presence, into the fullness of joy that is the vision of his glory. God in Christ steps into our world because he wants no-one to be lost, and so he gives to each and all the possibility of changing their lives and being recreated through the Spirit. The heart of our gospel proclamation is always to say, pointing at the cross, 'See how he loves you!' and to say, pointing at the work of the Spirit in the Body of Christ, 'See what you might become!' So that when we seek to share the good news, we always begin with these two moments – gratitude for the work of redemption and hope for our transformation. But now we must go a step further. This is the hope, this is the responsibility, this is why we give our energies to these great goals of justice and healing that we shall be discussing in the days to come. But if Christ gives us such responsibility, what he is doing is to give us the grace to be drawn into what he is doing. And when we are drawn into what he is doing, we are drawn into walking his way of the cross. He is the Good Shepherd because he is prepared to give his life for the flock; and we who are called into the life of his Body live in the same readiness to give everything for the sake of the precious life of those God loves. And for us who are called not only into the life of the Body but into that ministry of shepherding that seeks to preserve the Body in unity and love – those of us who are called to be bishops and pastors – this summons to walk in Christ's way is one that should sober us, perhaps it should even frighten us. 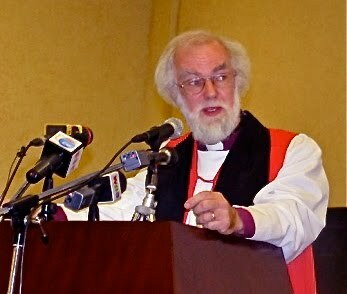 When I ordain a new bishop, one of the most deeply moving and significant moments in the service for me is when, after I have asked the new bishop to declare his commitment to scriptural faith and holiness of life, I then say to him that all this is too much for him to bear in his own strength and summon him and the whole congregation to silent prayer for the gift of the Spirit. Only in that moment can we lay aside our fears as we open ourselves to what Jesus calls the promise of the Father (Acts 1.4). So before we begin our reflections together about how we pursue God's justice and peace and healing in this continent and this world, we pause here in worship to think about the kind of life we must be living as pastors and leaders of this community where the new creation is coming to birth. And if we listen carefully to what the Lord is saying in this gospel reading, we have some essential clues. I want to underline two in particular. The first is in the words Jesus speaks about the sheep following him because they know his voice. They recognise that he speaks to what is most real and profound in them – to that level of their human existence where the divine image still lives, hidden by sin and forgetfulness and confusion, yet still alive, waiting to be called back to fullness of life. So the challenge to us who are pastors is, 'Do we speak at that level? Do we speak in such a way that people recognise that we are addressing what is most real and alive in them?' Sometimes it is said that Christian pastors spend their time constructing perfect answers to questions that nobody is asking! I suspect that may be more of a problem in the European churches than it is here. Yet the temptation is real for all of us to ignore the deepest and sometimes the most difficult questions in people's hearts and minds. We listen to Jesus and then we must learn to listen to those we lead and serve, to find out what their own hopes and needs and confusions are. We must love and attend to their humanity in all its diversity, so that we become better able to address words of hope and challenge to them. We cannot assume we always know better, that we always have the right answer to any specific question. What we have is the ultimate true answer to every need of human beings, Jesus himself – but this doesn't mean that we are always going to be right on this or that practical question just because we are pastors or bishops – or Archbishops of Canterbury! We need to learn the language of those we serve. The best and greatest of the missionaries who carried the Christian faith to new territories made a priority of leaning the language. But this is never just a matter of learning the words, learning how to say what you want to say in new ways – it is also about learning to listen and respect. So much of our work this week is going to be about this respectful listening to see if we really understand the needs of our people. And if and when we learn that, we are some way towards that Christ-like ministry where our speaking and serving reflect a bit better the service of the one great Shepherd whose voice is recognised because he truly understands who we are as human beings made in his image. That leads on to the second aspect of the Good Shepherd's service that we shepherds must seek to grow into. The Good Shepherd does not abandon his flock when they are at risk; he shares their danger. It is only the hired man who will run away – because he does not have the passionate attachment to the flock that the Good Shepherd has. In theological terms, we could say that the Good Shepherd can never abandon his own Body – these are his own people, purchased with his blood, and his life and theirs are utterly bound up together. He does indeed understand them from the inside: truly human and truly divine, he knows – as the letter to the Hebrews so wonderfully spells out – all the temptations and troubles we know. And in his incarnate life, he exposes himself to the full weight of human sin, to violence and rejection, to the cost and the effect of all that is done wrong in the world. He is a Good Shepherd because he will not separate himself from those he serves. He takes the consequence of their sin and failure and he takes the risk of living alongside them. So for us who have been called to Christian leadership, the message is clear. We cannot refuse to take risks alongside our people and to take risks for them – to put ourselves and our safety or comfort at risk for the sake of the community's life. Our authority comes not from being at a safe distance but from being there with those who need our ministry. And we may well think of all those in this continent who in the past and the present have so bravely stayed with their people, who have not sought safety or comfort but have stood alongside God's precious children and risked so much so as to be able to go on speaking the word of life. In this country, as we have already been reminded this morning, we cannot fail to remember Janani Luwum; but in our own times, there have been many who have courageously continued in this tradition – and here we think specially today with celebration and thanksgiving of our brothers in Sudan, in DRC and Zimbabwe whose authority as pastors in the church of God rests so deeply on their willingness to take risks alongside their flock and for them – while witnesses, in St Peter's words, witnesses to both suffering and glory. One of the focal points of this Conference is the renewal of leadership in Africa. And all of us know that, here as elsewhere in the world, there can be no lasting justice without sacrificial and selfless political leadership. We who are called to lead in the Christian community will seldom if ever be ourselves in a position to make the great political decisions; but we can and we must go on seeking to model a leadership that is self-giving, humble and yet clear and authoritative, rooted in our identification with our people and never looking for private advantage. The clarity of Christian and especially Anglican witness against corruption in political leadership in so many contexts in this continent has been a great beacon for many elsewhere, and our prayer is that it will continue with the same force and integrity, always underpinned by this personal integrity in Christian leadership, by the way we seek to show the face of the Good Shepherd who stands with his flock and never seeks safety or ease at their expense. God knows, all our churches throughout the world need this witness, and we are all – myself included – painfully aware of how often we can try and step aside from the risks that our responsibilities bring. But God who has called us is faithful; and we are assured again and again that he gives the grace to overcome. So as we begin this deeply significant meeting, let us hold firmly before us the vision of the gospel we have heard. We are called to open the door that is Jesus – the door into fullness of life in a world full of selfishness and insensitivity to pain and poverty. We are called to do this, not for some purely humanitarian reason but because of God's passionate longing for mercy, joy and reconciliation in the world he has made. We are called, we who are pastors and leaders, to follow this imperative by the transformation of our own lives – by recognising our own humanity and seeking grace every hour of every day; by labouring without interruption to find ways of speaking to the depths and the true heart of all those we seek to serve so that our voice can be recognised as a voice of hope and renewal; by standing alongside our people in life and death, as so many of the saints and heroes of this continent have done. It has been said that this is going to be the African century of the Christian Church in terms of energy and growth and vision. Archbishop Mouneer has already reminded us of this and of its deep roots in Christian history. God raises up different countries and cultures in different seasons to bear witness to his purpose in a specially marked way, and it may be that this is indeed his will for Africa in the years ahead. And if the churches of Africa are going to be for this time a city set on a hill, how very important it will be for the health and growth of all God's churches throughout the world that this witness continues at its best and highest. In this meeting, God has given us the grace to come together for just this end, to reflect on how the bishop's ministry can best serve and show the new creation, the one great hope for men and women to be truly free and joyful as they work against all the terrible things that wound the image of God in us and hold back the potential of those whom God loves so passionately. We in the Church worldwide pray with you, with all our hearts, that your hopes and goals in this meeting will be wonderfully realised and that you will be able to speak a word not only for this continent but for all God's people, a word that all will hear and recognise as the calling of the eternal Word to the world he loves, the calling into fullness of life. And to that life eternal and joyful, a life in vision of the father, in fellowship with Jesus Christ, in the joy and communion of the Holy Spirit may God through his Grace bring us all. Amen.